This second edition of the successful ready reference is updated and revised with approximately 30% new content to reflect the numerous instrumental developments and improvements, as well as the significant expansion of this rapidly developing field. For example, the combination of IR imaging with AFM has enhanced the achievable lateral resolution by an order of magnitude down to a few hundred nanometers, thus launching a multiplicity of new applications in material science. Furthermore, Raman and IR spectroscopic imaging have become key technologies for the life sciences and today contribute tremendously to a better and more detailed understanding of numerous biological and medical research topics. The topical structure of this new edition is now subdivided into four parts. 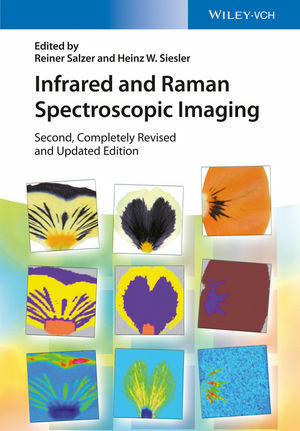 The first treats the fundamentals of the instrumentation for infrared and Raman imaging and mapping and an overview on the chemometric tools for image analysis. The second part describes a wide varie-ty of applications ranging from biomedical via food, agriculture and plants to polymers and pharmaceuticals. This is followed by a description of imaging techniques operating beyond the diffraction limit, while the final part covers special methodical developments and their utility in specific fields. With its many valuable practical tips, this is a must-have overview for researchers in academic and industrial laboratories wishing to obtain reliable results with this method. Reiner Salzer is Professor Emeritus of Analytical Chemistry at the Dresden University of Technology (Germany). He has authored almost 300 publications and serves on various national and international scientific boards. Professor Salzer is a member of the Norwegian Academy of Science and a recipient of the Emich Plaque of the Austrian Society of Analytical Chemistry. Recently he also received the Clemens Winkler Medal of the GDCh (German Chemical Society), the Hanus Medal of the Czech Chemical Society and the Ioannes Marcus Marci Medal of the Czech Spectroscopic Society. Professor Salzer served as President of the Division Analytical Chemistry of the GDCh and is National Delegate to the Division Analytical Chemistry of EuCheMS, where he is Head of the Study Group Education. He is Chairman of the ECTN Label Committee for the Quality Eurolabels in Chemistry Education. head in molecular spectroscopy and thermal analysis in the Corporate R&D Department of Bayer AG (Dormagen, Germany). Between 1992 and 2010 he held guest professorships in France, Japan, and Austria. Professor Siesler is a recipient of the EAS Award, the Tomas Hirschfeld Award and the Buechi Award in near-infrared spectroscopy and he is a Fellow of the Society for Applied Spectroscopy. His main research focuses on the application of vibrational spectroscopy to chemical and polymer research, analysis and quality control, and he has authored more than 230 publications in this field. With approximately 30% new content, this second edition is updated and revised to include the recent technological, methodological and scientific developments in the field. There is a new section on "Imaging beyond the Diffraction Limit", which is rapidly developing. Also the section on "Developments in Methodology" is significantly revised to reflect the recent advances.